The Dram Tree (center), once located just south of Sunset Park, drew its name from the tradition of sailors taking a dram of rum there, either to celebrate their passage through the tricky shoals of Cape Fear or to steady their nerves as they headed for open seas. The tree became a political boundary in Colonial days when, during the rivalry between Newton (later Wilmington) and Brunswick Town, Newton boatmen refused to carry produce any closer to Brunswick than the Dram Tree. It was used as a buoy during nineteenth-century sailing races and, in 1909, the tree was a star attraction when President William Howard Taft visited Wilmington. According to Louis T. Moore, the Cape Fear River once was “a veritable forest of masts.” The schooners pictured here are the Edward R. Smith and the Nomis, but tall ships would soon become rare sights on the river. Their allure has never been matched. Thirty miles of unbroken tree-studded shoreline can be enjoyed from a big, high-backed easy rocker on the breeze-swept upper deck,” stated on ebullient Morning Star writer, about 1918, of the steamer Wilmington. Captain John W. Harper’s flagship first entered the Cape Fear River in 1891. It had an iron propeller, was 130 feet long, and on a good day could reach a speed of 16 miles an hour. The Wilmington, equipped to carry 511 passengers, made stops on request, but docked routinely at Orton Plantation, Southport, and Carolina Beach. Groups from both white and black Sunday schools frequently rented the steamer for annual picnics. Dr. Robert M. Fales (1907-1995) rode aboard the Wilmington when members of First Baptist Church made their semi-annual trek to Carolina Beach, visiting Wrightsville Beach on alternate years. “Other than Chirstmas Day, most children in town considered the Sunday School excursion the best day of the year,” said Dr. Fales. “The Wilmington was a swift vessel and had practically no vibration,” he said. Captain L. D. Potter, owner of a large and powerful tugboat christened The O’Brien Girls, purchased a smaller steamer, Isleboro, and renamed it City of Southport. It left Wilmington every day at 10 a.m. and departed Southport at 4 p.m. It was a successful venture for several years. This photograph was taken just east of the Cape Fear River, about 1925, at Hilton Lumber Company, not far from the spot where Cornelius Harnett’s colonlal home, “Maynard,” once stood. Smith Creek, pictured here in relatively pristine condition, was still a popular recreational destination in those days. A 1907 account of a voyage aboard Maffitt’s launch, Scuppernong, appeared in the Wilmington Dispatch, and is assumed to have been written by Dispatch reporter Louis T. Moore. “Another delightful boating party transpired this week, given by C. D. Maffitt complimentary to Miss Fannie Murchison and friends. Up the Cape Fear to just above Angola went the trim little craft, then up Smith’s Creek for 7 or 8 miles. Aboard the boat refreshments were served and music rendered by a Victor talking machine which presented records of Melba, Patti, Caruso and others. This standard size photograph was taken March 1, 1912 by Louis T. Moore. At that time, the ferry system was owned by Oscar Durant in Wilmington, but an African American family, the Joneses of Brunswick County, operated it. The man standing near the stern is William Jones, a veteran ferryman. The passengers are probably Brunswick County farmers who regularly took the ferry on Friday, bringing their wares to Wilmington for the Saturday market. They returned on Saturday afternoon. Bill Jones ran the ferry system when it was little more than a rowboat. Three or four passengers per trip paid five cents apiece to Mr. Durant, who kept the coins in a pouch he called a “shotsack.” Bill Jones, a tall, powerfully built man, worked the oars from one side of the river to the other, and back again. He also collected fees in Mr. Durant’s absence. After 1900, the flat pictured here replaced the little rowboat. The May, a gas launch that propelled the flat across the river and warped it onto the landing, was added in 1906 after much refurbishment. Forces of nature made the job difficult. 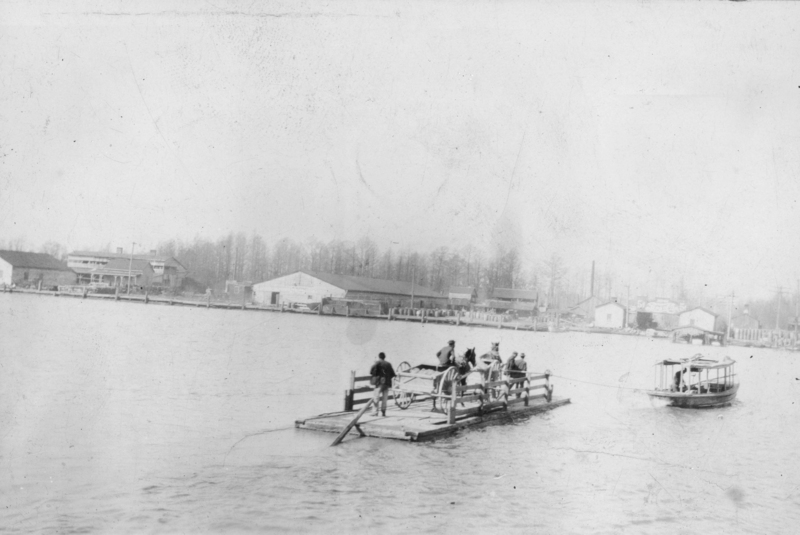 In 1908, heavy flooding left 2 to 5 feet of water on Eagles Island, the ferry equipment had to be tied to trees until the turbulent waters subsided. A horse jumped overboard one rough day, pulling a buggy with him. And once, a whole carload of people met their death when their vehicle slipped back into troubled water at the Wilmington dock. Divers retrieved the bodies and, just hours later, a small crane lifted the automobile out of the water. The car’s lights were still burning, a fact used later in a battery advertisement. The ferry John Knox (on right) was named for a chairman of the Brunswick County Commissioners, not the fiery Scottish clergyman. Built in Morehead City in 1919, it cost $43,000. This photograph was taken in 1935, when H M S Scarborough visited Wilmington. (see 940) Another ferry, the Menantic was purchased used, in New York, for $22,000 and arrived in Wilmington, May 2, 1924. In 1929, their last year of operation, the ferries’ service receipts totalled $93,000, based on charges of 84 cents per round trip. In this view, Point Peter is on the left and Eagles Island, on the right. The 800-acre tract directly across the river from downtown Wilmington is named for Richard Eagles who acquired the property in the 1730s. Louis T. Moore, a stickler for historical accuracy, read seven newspapers a day. In the 1950s, he noticed the local paper was habitually omitting the “s” in Eagles Island. He wrote the editor, his good friend Al Dickson, requesting that he “cease and desist from trying to change an historical name which has stood the test of time for about 225 years” and suggested his reporters be forced to write it a hundred times on the blackboard of the local news room. Louis Moore’s grandfather and uncle, Benjamin and W. L. Beery, owned Beery Shipyard on Eagles Island. The night Fort Fisher fell, January 15, 1865, the Berrys burned their shipyard rather than have it destroyed by General Terry and his Union soldiers. After the fire, all that was left of the Eagles Island enterprise was a tall brick chimney. Vines soon covered the chimney and it became a conversation piece for Wilmingtonians gazing across at the island. Seaboard Air Line facilities, pictured here in 1935, included five large warehouses that had a combined capacity to store 200,000 feet of goods, and their wharves could accommodate six oceangoing steamers. Seaboard owned the only deepwater slips in Wilmington. Water depth and electric winches allowed them to unload 10,000 tons of scrap iron per ship. Their passenger trains gave Wilmingtonians access to points west of the city like Charlotte that were not served by the south-north rails of the Atlantic Coast Line. On July 31, 1919, the Seminole hosted Josephus Daniels, Secretary of the Navy, during the christening of the Cape Fear, a reinforced concrete ship built in Wilmington. Sec. Daniels watched from the Seminole deck as Liberty Shipyard employees launched the ship sideways. It hit the water hard and listed far to one side and then the other, creating walls of water that soaked hundreds of spectators. Small boats were washed up on shore and some of their passengers had to be plucked from the water. During prohibition, the Seminole went on many liquor patrols, including one off the coast of New England that turned violent. Here, the Coast Guard Cutters Modoc and McAdoo dock at Wilmington, while the plodding ferryboat, Menantic, plies the waters. For many years, the houseboat in the foreground was home to an African American man. The McAdoo was named for William G. McAdoo, Secretary of the Treasury in Woodrow Wilson’s cabinet, a cozy position considering he was also married to Eleanor, one of Wilson’s daughters. President Wilson also appointed William McAdoo director general of railroads during World War I. In this capacity, he visited Wilmington in 1918, and socialized with his in-law’s old friends from the days when the President’s father served as minister of First Presbyterian Church. Here, longshoremen unload sugar at Champion Compress wharf. James Sprunt was well-known for his generosity to his African American employees. One who remembered him in 1999 was F. Clarence Jones of Brunswick County. Mr. Jones worked briefly for James Sprunt before he died in 1924, but members of the Jones family had worked for the Sprunts on the Wilmington wharves and at Orton Plantation for many years. “Mr. Sprunt always would provide things for the black people. You know they were poor as snakes back then. With Christmas coming, he would send his workmen to fruit stands, grocery stores and other places to buy up just tons of all kinds of things: meat, lard, flour, rice. And he’d have a barrel and he’d pack those barrels with what they bought, just as long as he could fit something else in it. Ham was a big thing. He put a ham in every barrel, then he’d put fruit on top and cover it over with burlap and put a hoop on it. Then all of his employees would have a barrel. This photograph, taken from the roof of the Murchison Building, shows the depth of the Champion Compress buildings (on right.) During Wilmington’s 1898 riot, the Sprunt business complex became a haven for African Americans. Clarence Jones’s uncle was one of them. Mr. Jones heard him tell the story many times and retold it in 1999. On her shakedown cruise, theUSS Perch arrived at Southport, January 14, 1937, for a two-day visit. She was accompanied by the tug Blanche and piloted through the fearful cape by Captain H. St. George. Lieut. Commander G. C. Crawford was greeted at the dock by Wilmington mayor Walter H. Blair, W. H. Sprunt, Lieut. J. J. Hutson, representative of the Modoc, and Louis T. Moore. On January 16, the Perch docked at the Champion Compress wharf in Wilmington where she remained for three days. The crew’s first two meals must have been a welcome break from submarine fare. The first stop was the Hotel Cape Fear for a luncheon hosted by Wilmington’s four civic clubs. Dinner that evening was an oyster roast at Harrill’s-on-the-Sound, off Greenville Loop Road. Louis T. Moore was busy for weeks prior to the sub’s visit, entreating collectors to bring blank covers to the Chamber of Commerce. He took over 500 envelopes aboard on January 16 for commemorative cancellation. “Affixing of the cachets is being handled by the Chamber of Commerce with the cooperation of the Cape Fear Stamp and Cover club,” Moore announced. Today, the Perch lies 190 feet beneath the surface of the Java Sea. During World War II, the submarine was part of the Pacific fleet. In March 1942, the 59-man crew was forced to abandon ship after it was damaged in battles with the Japanese Imperial Navy. The Japanese placed the entire crew in POW camps. Six of the Americans died, and 53 survived. The smokestacks of Tidewater Power Company dominate the scene at the foot of Castle Street. Tidewater Power was incorporated in 1907 when Hugh MacRae consolidated Wilmington Gas Light, Wilmington Street Railway and Wilmington Seaboard Railway companies. By the 1920s, the company owned and operated the local streetcar system and sold gas and power to 75 cities and towns. In 1924, Tidewater Power Company added a new 200-foot smokestack to the plant at the foot of Castle Street. The commercial improvement became the talk of the town when construction workers discovered remains of a ship, submerged near the shore. More than fifty people came forward to identify it, each with a story. Julius Herbst, a talented woodwright, crafted the boats, but his elderly father, Frank Herbst, was the center of attention. The first person to patent an inboard/outboard motor, a homing pigeon expert, former manager of Lumina pavilion, and an early automobile dealer — he had lots to talk about. A musician, too, he owned a violin that was over 250 years old. He liked to play it while his son and his employees went about the rough and dusty business of boat construction. At age 102, Frank Herbst, who thrived on a diet of oatmeal, decided he had lived long enough. He refused his porridge and died a few days later. 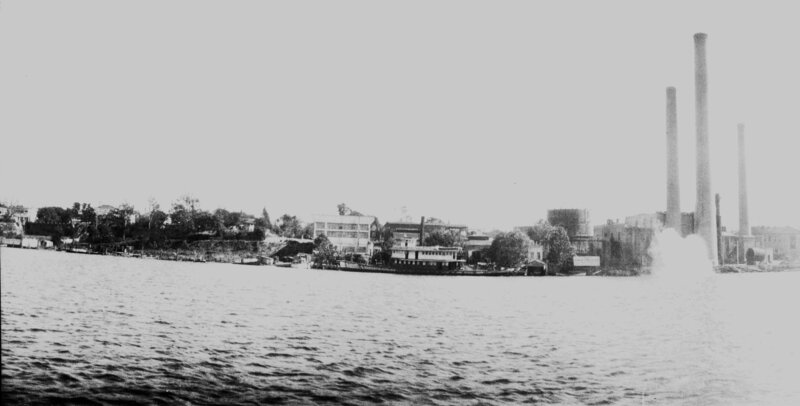 The Steamer WILMINGTON was sold in 1926 to the Bee Line Ferry Company. She ran as the WILMINGTON for a few years, and then in 1930 she was renovated and switched from being a steam vessel to a diesel vessel. At that time her name was changed to the PINELLAS. She ran between Pinellas Point in St. Petersburg, FL and Piney Point (Palmetto, FL) across Tampa Bay. During WWII the US Navy commandeered the Bee Line ferries. The PINELLAS had her name changed to the SEABROOK (YFB-38) and she ran between the Naval Air Station and Jacksonville, FL. Both Joe and David Winters had captained ferries for the Bee Line Company, but they moved with their families to Jacksonville and ran the boats for the Navy. After the War, the vessels were sold back to the Bee Line Ferry Company and ran until September 1954 when the first Sunshine Skyway Bridge was completed across Tampa Bay. Capt. Joe Winters then purchased the old ferry and renamed her the MISS PINELLAS and ran her for fishing and other excursions under the name Tampa Bay Excursions, Inc. The boat was sold in October 1965. The last I currently know of her was that she had been discovered by the US Coast Guard adrift off the coast of Cuba. The current owners had struck a deal to return a group back to Cuba. At the time, Arthur Velasco, an owner, said it was unsure if the MISS PINELLAS would be sent to South America to run on the Amazon River, but he would see.